ROLEX REF. 6262 PAUL NEWMAN BLACK DIAL STEEL Rolex, "Cosmograph Daytona," No. 2623024, Ref. 6262/6239. Made circa 1970. Very fine and very rare, water-resistant, stainless steel wristwatch with round-button chronograph, registers, tachometer and a stainless steel Rolex Oyster bracelet. Three-body, polished and brushed, screwed- down case back and winding crown, tachometer graduation on the steel bezel to 200 units per hour. Bicolor black and off-white with applied black steel square indexes and luminous dots, subsidiary dials for the seconds, the 12-hour and 30-minute registers, outer red 1/5th seconds track. Luminous steel baton hands. Cal. 727, rhodium-plated, 17 jewels, straight- line lever escapement, monometallic balance adjusted to 3 positions, shock absorber, self-compensating free-sprung Breguet balance spring, Microstella regulating screws. C. Three-body, polished and brushed, screwed- down case back and winding crown, tachometer graduation on the steel bezel to 200 units per hour. D. Bicolor black and off-white with applied black steel square indexes and luminous dots, subsidiary dials for the seconds, the 12-hour and 30-minute registers, outer red 1/5th seconds track. Luminous steel baton hands. M. Cal. 727, rhodium-plated, 17 jewels, straight- line lever escapement, monometallic balance adjusted to 3 positions, shock absorber, self-compensating free-sprung Breguet balance spring, Microstella regulating screws. Dial, case and movement signed. DIAM. 36 mm. THICKNESS 13 mm. Approx. overall length 180 mm. Introduced in 1970 the ROLEX DAYTONA REF. 6262 was the updated version of the REF. 6239 featuring an improved and more accurate Cal. 727 movement. 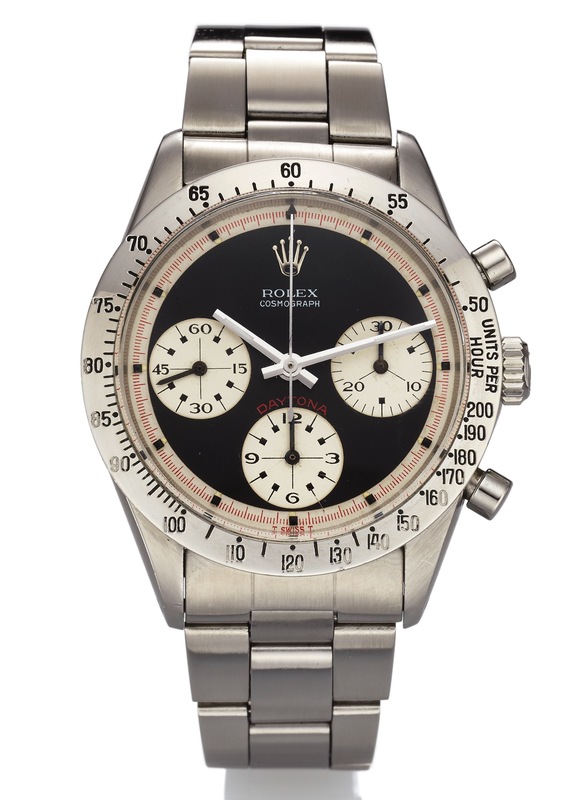 Considered one of the rarest Daytona references produced, the 6262 model was replaced by the Ref. 6265 with screw-down pushers circa 1971. Examples of Ref. 6262 with a black PAUL NEWMAN dial are particularly rare.